We woke up to more rain, which meant packing away soggy tents. 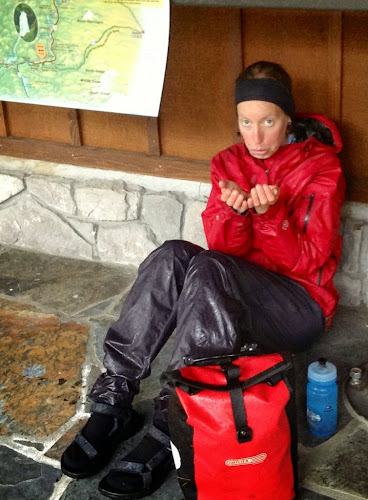 While packing away a soggy tent is fine and dandy, putting up a soggy tent the next night is not a good thing. We would need to find a way to dry our tents. We began our morning with a climb up and over Santiam Pass. Near the top of the summit, the rain turned to snow. Goody, more snow! Snowflakes at the top of Santiam Pass. Being wet, in and of itself, is not a big deal. Likewise, being cold, in and of itself, is not a big deal. But when you combine wet and cold, the combination is not pretty. Particularly when you're descending at fast speeds, such that wind also becomes a factor. I'm not typically an eat-the-second-breakfast-of-the-day-at-a-restaurant person. But today I was. Anything to get out of the wet and cold! Alex and I pulled over at the one-and-only restaurant for miles and miles. We ran inside and ordered coffee (for Alex) and tea (for me). 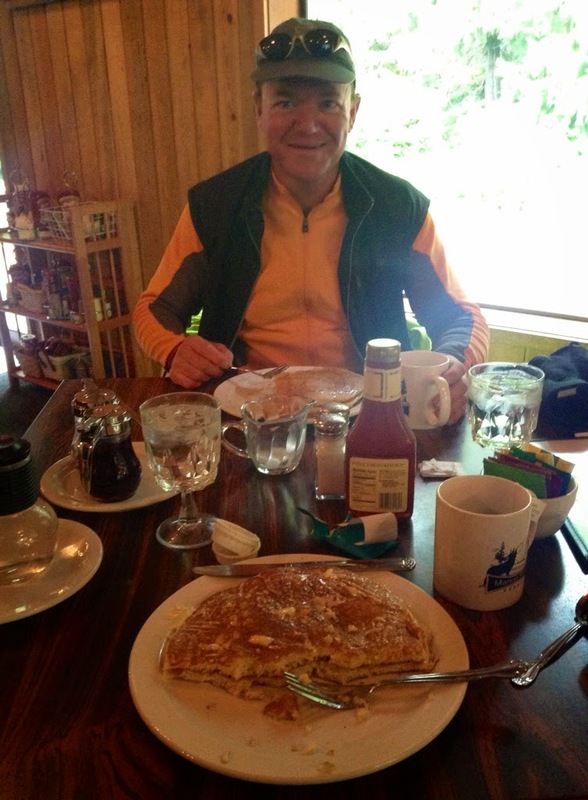 As it was time for our second breakfast, and as neither of us could stomach the idea of eating outside in the cold rain, we both ordered pancakes. Despite being indoors and drinking warm drinks, neither of us was able to kick our chills. We commented that it didn't even seem as though the restaurant had any heat! 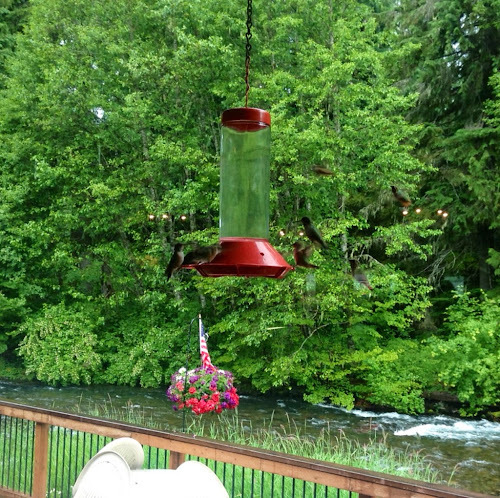 Fortunately, there was a bonanza of hummingbird activity at the feeder just outside the window next to our table. Watching the feeder helped to distract us from our goosebumps. I have never seen so many hummingbirds in one place! Look closely. How many hummingbirds do you see? 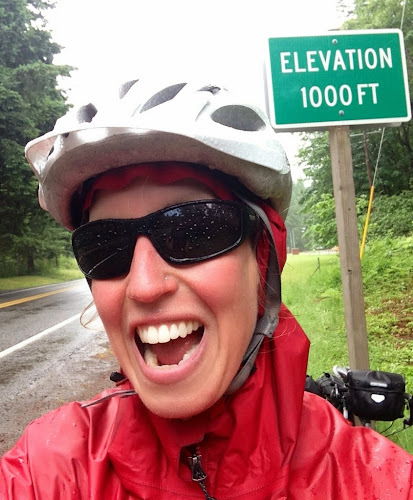 After our second breakfast, we reluctantly hopped on the bikes and continued pedaling through the rain and the cold. Eventually we descended to about 1,500 ft, where the temperatures were warmer. We stopped at a market in the tiny town of Idanha, in hopes that there'd be an Oregon map for sale. Sure enough, there was! We bought the map and used it to plot a different route. We figured that if we stick to the more major roads (i.e. those roads that appear on a typical state map), then we should be able to avoid gravel. The official Sierra-Cascades route takes us on a very winding tour of Washington state. Our new route is going to take us west towards Salem and then north along the I-5 corridor. This will be a flatter and more direct route to the Candian border. 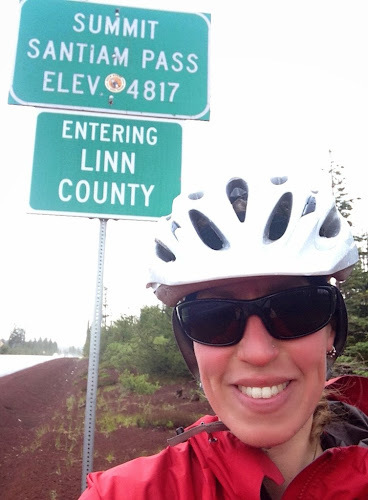 As we're both anxious to wrap up this ride, and as I've already ridden much of the route through Washington, I'm fine with the new plan. 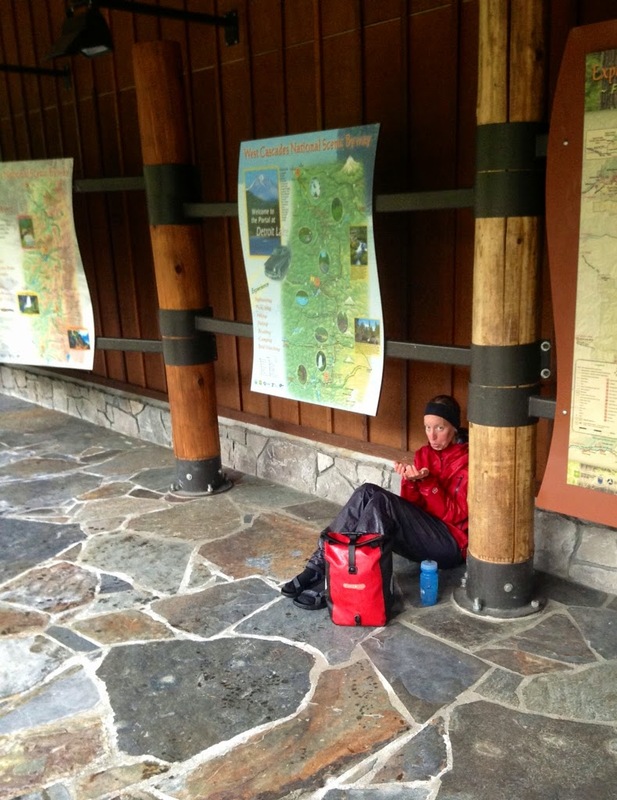 After we began our new route, we pulled over at a roadside ranger station for our first lunch. The station had a nice, deep overhang under which we could shovel calories into our mouth. There are times when I'm on tour when I feel like a homeless person. These are typically times when I'm eating in places where people don't typically eat -- like outside a grocery store...or a ranger station. And when I'm soaking wet. All I need is a cardboard sign. 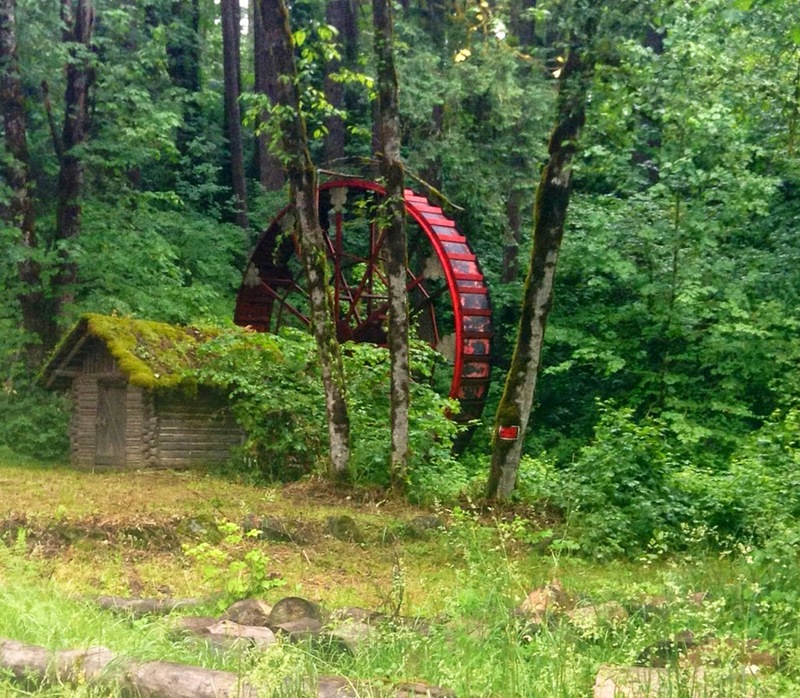 Miles later, when we pulled off to the side of the road for a wardrobe change -- to remove warmth layers but not precipitation layers -- we spotted this old Ferris wheel-looking contraption off to the side of the road. It begs a question, though I'm not necessarily sure which question. The wheel, begging a question. For the first time since Southern California, we're back down to 1000 ft. I'm always amazed how much road grime ends up on my shoes and legs at the end of a dry day's ride. But, I'm even more amazed at the road grime at the end of a wet day's ride. Yuckarooney! 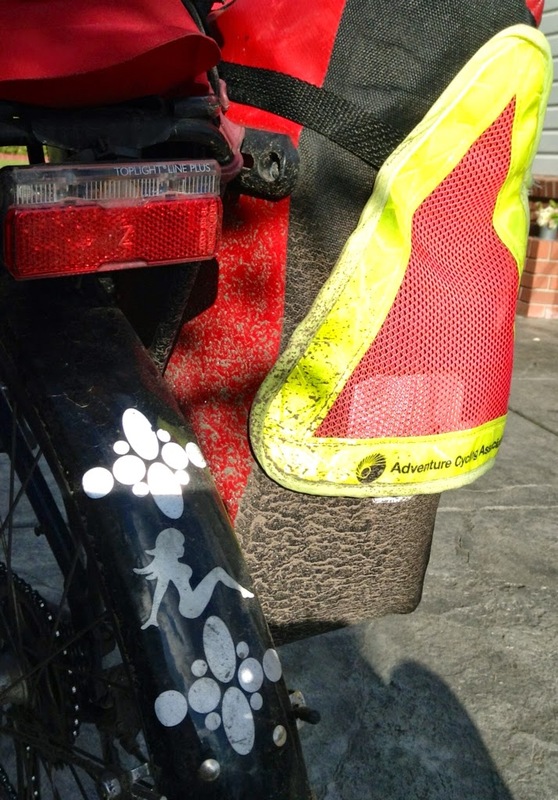 That's one heckuva dirty pannier. After putting in a good number of miles today, we decided we should probably make the town of Sublimity our home for the evening. Hell, who wouldn't want to stay in a town by the name of Sublimity! Lucky for us, the town of Sublimity provided the first rain-free skies we'd seen all day, though there were threatening, ominous clouds in all directions. Alex seemed concerned that there were no hotels or campgrounds in town. Not to worry, my friend, tonight we will sleep in Sarah Steath Style! I found the local park, school, and church on the map. Typically, one of these locations should be fruitful in providing an ideal stealth experience. As it turns out, all three locations were adjacent to one another, and so it didn't take long to complete our reconnaissance mission. As is the case with many small towns, Sublimity has a covered picnic area in its city park. Bingo! This would be perfect for drying out our wet gear. Alex and I spread out our gear under the roof, just in case the rains began again. 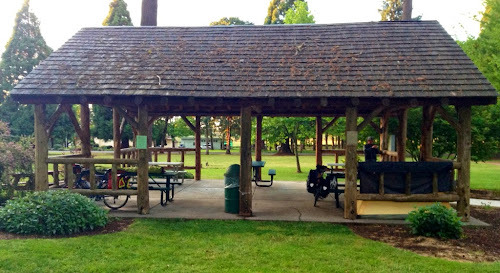 While the gear was drying, we plugged our devices into the electrical outlets (conveniently located within the picnic area), we used the nearby flush toilets, and we had dinner. About an hour later, our gear was dry. We packed up our things and went in search of a coffee shop. Alas, the search was not fruitful -- the only coffee shop in town had closed hours earlier. Shortly before dusk, we returned to the picnic shelter and set up for the evening. Can you spot our homes for the night? Alex prefers a pampered stealth experience. My stealth camping set-up is a bit more minimalist--more ideal for a quick get-away. 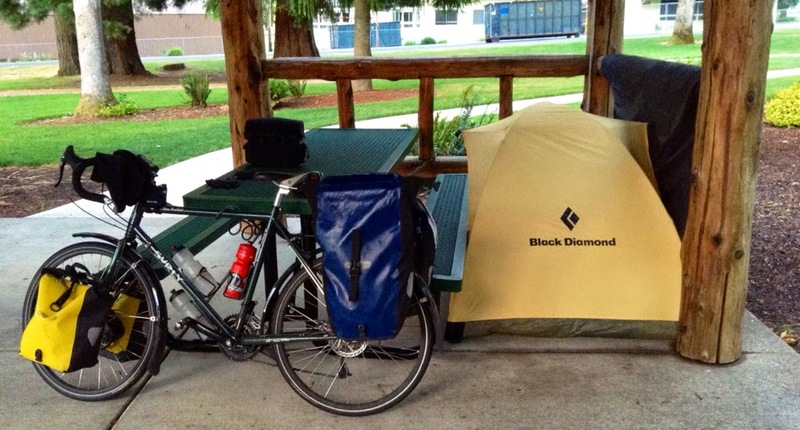 In the morning, we'll see what Alex has to say about his first in-town stealth camping experience. 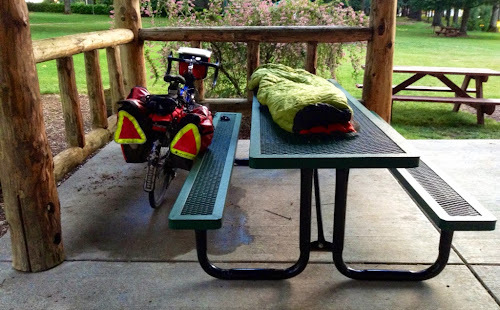 Personally, I think this kind of camping is just sublime! There are bathrooms, and water, and electricity, and shelter from the rain. Plus, there's an element of risk that adds flavor to the adventure. also, 8? Wow, must have been a lot of squeaking. That wheel looks like an old water wheel used to power something. Ride up and get some of that water, Ron! ;) Yes, the adventure continues! I hope your adventures are continuing as well!